Bees do love the poppies! When last we posted, a brief report for Garden Bloggers' Bloom Day back in April, the Head Gardener and I were in serious spring gardening mode. Much to our delight, spring hung around longer than usual throughout the Houston area and the temperatures were remarkably pleasant in May and even into June. We took full advantage of the balmy weather in May. In the midst of cleaning out spent spring annuals, pulling weeds and spreading compost, the HG also talked me into enlarging the paths in the back garden, which necessitated moving moss rocks around and toting bags of decomposed granite from the truck to the back. She SAID that reducing the beds in size would make them easier to maintain and she was unanimous in that. As frequently happens with these ideas of hers, we traded future ease of maintenance for some damned hard work in the here and now. First my left knee and hip began complaining and once they'd settled down, the right knee joined the party. I keep telling her we should hire some stronger younger helpers but she refuses to listen, obstinate woman that she is. However, she did agree to wait until fall to finish enlarging the paths. know it was even possible for them to be that floriferous! May was also notable for the long weekend spent in Savannah, Georgia with some garden blogging compadres. We saw some delightful gardens, met some wonderful Southern gardeners and came home refreshed and ready to get back to work here at Wit's End. June was notable for a less than felicitous reason: as I was working in iPhoto on my MacBook, one second I had 14,700+ photos ... and the next, they were gone. With the help of the Genius Bar at the Apple Store, perhaps 9500 of them were retrieved. The rest are gone, including, I fear, those I took at Garden Bloggers' Flings in Seattle, Asheville and San Francisco. I've stopped kicking myself for not backing up my files but thinking about it does make me sad. have been spectacular this year! Speaking of the Garden Bloggers' Fling, this time tomorrow the Head Gardener and I will be in Portland, Oregon for the 7th annual Fling. We're excited to visit a city which we've heard praised for its gardens and we were looking forward to the cooler temperatures Portlandia usually boasts in July. I say were because the forecast is now calling for 90+ degrees all 3 days. This happened in San Francisco last year ... I'm beginning to think we Texas bloggers are a jinx. I love that little Ships of the Sea Museum in Savannah. I usually get down there in the fall and always go out of my way to tour the place. Must look for that guava! 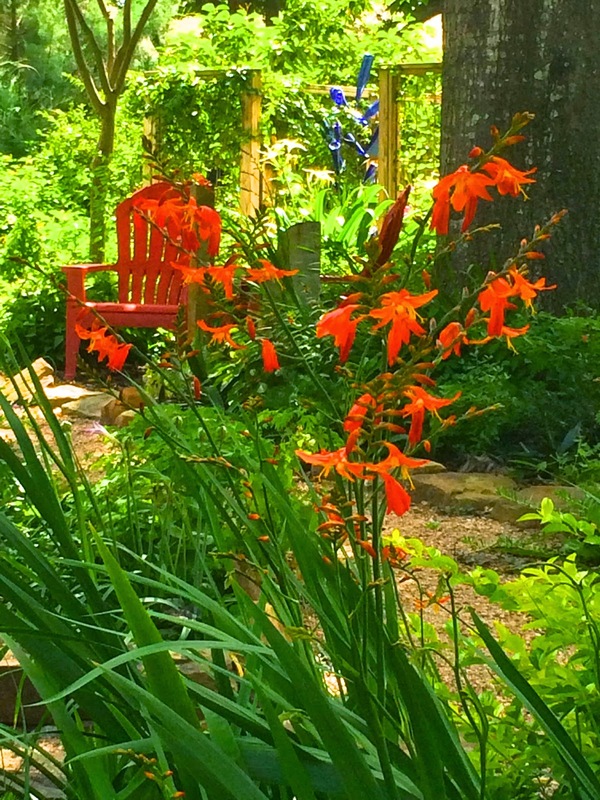 The crocosmia looks great, especially with that chair! The salvia madrensis you gave me is doing well and maybe by the time you get back from Portland it will be blooming! Take care and have fun. Sorry to hear of your photo losses. Somehow I lost around 150 of my favorite photos due to a memory card glitch. I can't imagine losing so many, but I'm glad they could recover a bunch of them. 90 degrees again!?! How far north do the Flings have to go to break the jinx? Next year is Canada? Perhaps that should do it. Have fun and say hello for me. I'll be stuck here moving dirt around in my front yard and reworking the now sunny flower beds. I love seeing your gardens. It was incredible to meet you! 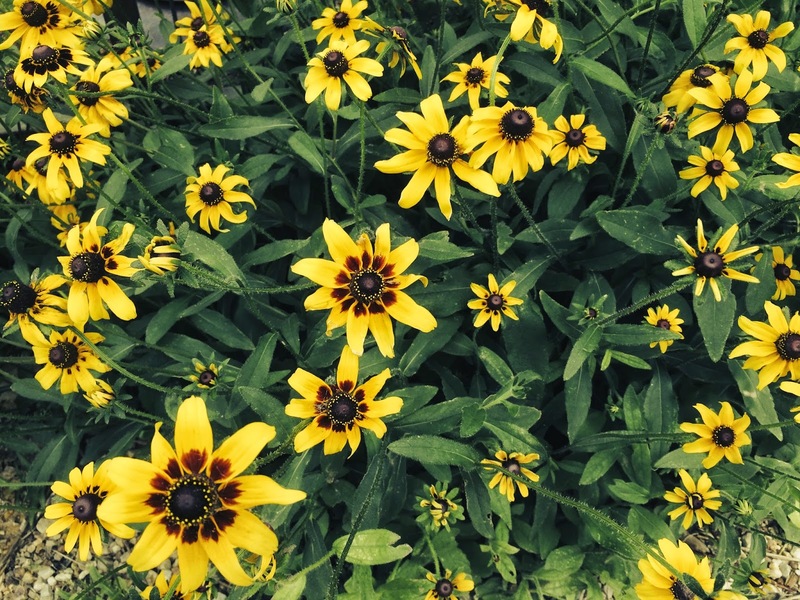 Your garden looks fabulous! Lost photos? Yikes! Note to self: back up my files!